From The Asian Reporter, V16, #11 (March 14, 2006), page 13. Most genre fiction, especially in an overloaded area such as mystery writing, offers a new twist on a familiar theme and little else. After a few pages it is apparent that, in spite of the introduction of a detective who is also (say) an anthropologist, the book is merely the same dish served with a different sauce — the author’s strange setting, characters, and plot are quickly lost in familiar tropes and the same tired writing. Occasionally, however, a new series is introduced that is truly something unique; the exotic themes and characters resonate throughout the book’s plot, characters, and even the writing itself. I.J. Parker’s excellent series, featuring the 11th-century Japanese nobleman Sugawara Akitada as her detective, accomplishes this difficult feat, continuing with her latest offering, The Dragon Scroll. Even though it is Parker’s third book about Akitada, The Dragon Scroll takes place before the other two, at the beginning of his career in government and sleuthing. As his first assignment at the Ministry of Justice, junior clerk Akitada is sent to the distant province of Kazusa to figure out where all the tax convoys have been going. Representing the wealth due to the emperor, these well-guarded convoys have been disappearing en route to the capital without a trace, suggesting internal corruption or complicity. In fact, the fate of the convoys isn’t meant to be found, and Akitada has been set up to fail his very first assignment. But he’s unaware of the impossibility of his task, and so works earnestly to unravel the tangled thread of deceit behind the convoys’ disappearances. Along the way, he meets and retains the bodyguard Tora, a familiar figure to readers of Parker’s other mysteries, and encounters a host of interesting locals, including the crippled wrestler Hikeguro and his beautiful daughters, the deaf painter Otoki and the free-spirited Ayako. Even as he falls for Ayako, Akitada discovers that Otoki may have seen more about the crime than she can express, except in her beautiful Buddhist paintings, one of which becomes an important clue to him. When the former governor of the province invites Akitada to a secret meeting and turns up dead soon afterwards, the junior clerk finds his investigation broadening to include a murder. Parker’s skill shows not only in her deft maneuvering and careful plotting, hallmarks of any good mystery writer, but also in the completeness of her vision. Akitada is not a transplanted Sherlock Holmes or Miss Marple; he is a creature of his own time, knowledgeable about 11th-century detective techniques, but also subject to the idiosyncrasies of his era. Even as he fights to solve the central mystery of the novel he must overcome social prejudices and navigate the difficult politics of Heian Era Japan. Parker’s writing, from its Eastern metaphors to its clean, crisp rhythms, is as simple and elegant as a master’s calligraphy, wrapping the reader in the comfortable illusion of living in 11th-century Japan. Readers of Parker’s other works will be familiar with the characters, but it will be fun to see them in an earlier time, as if in a "Before They Were Stars" special. Akitada’s servant Seimei is as crotchety and hidebound as ever, but he reveals a softer side when it comes to Tora. For his part, Tora becomes less of an enigma, as we see how he becomes an integral part of both Akitada’s household and his mystery-solving, even as he falls prey to his usual traps of saké and pretty women. Akitada himself, pitted against beautiful seductresses and scheming government officials, is as endearing as ever, although not yet as wise as he becomes in the other books. Akitada’s relationship with another minor character, Tasuku, provides a suitable framing device for the book, shedding light on the mystery as well as Akitada’s own emotions facing the strictures of his culture. From its exciting opening pages to the satisfyingly tidy conclusion, The Dragon Scroll is a compelling and marvelous mystery, true to its Asian sources throughout. 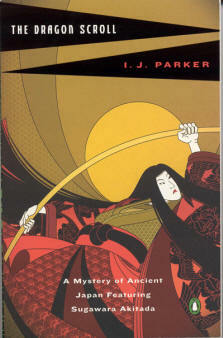 Parker’s historical notes at the end attest both to her own research efforts and to the instructive nature of the book, for it is here that the reader can discover all the finer points of Japanese history and culture revealed throughout the book. Without exhaustive explanations of cultural artifacts or social minutiae, we have unconsciously absorbed vital information about the plot and setting, the most pleasurable sort of history lesson imaginable. Parker has done more than just tweak the mystery genre; she has established a whole new foothold in this territory with a series that is remarkable, eminently readable, and utterly absorbing. It is easy to see why Parker’s first Akitada story, "Akitada’s First Case," earned her the Shamus Award, and her ever-expanding readership will anxiously await the next installment about her intrepid and clever sleuth, Sugawara Akitada.